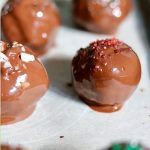 This easy healthy and decadent Vegan Chocolate Truffles Recipe is perfect for the holidays. 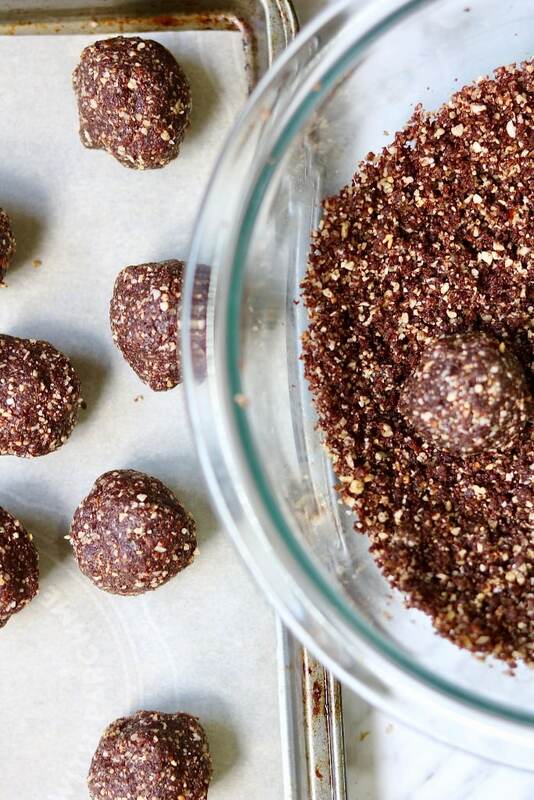 These raw vegan truffles are protein packed with dates, almonds, sunflower seeds, walnuts, cocoa powder, peanut butter and vanilla, and rolled in melted dark chocolate – OH MY!😳 And they’re gluten free and easily oil free. This is one easy dessert recipe folks! To start add the dates to a soup bowl and cover with boiling water ( at least 5 minutes to soften). Meanwhile add all the nuts to the food processor and process till completely broken down. Drain the dates well and add them to the food processor with the rest of the ingredients (except oil). Process till everything is completely mixed. You might have to scrape the sides a few times. The end result will be a fine mealy nutty mixture. Now you just form one inch or so balls with your hand. It’s not so much rolling into a ball but forming one by squeezing the mixture with the palm of your hand and then shaping into a ball. These Vegan Chocolate Truffles hold together really well. Now place formed balls on parchment lined tray and place in freezer to harden (makes rolling easier), while preparing your chocolate. Start by breaking up your chocolate bars and adding it to your double boiler, along with oil and set to medium heat-low heat, so water simmers gently (my double boiler consists of a medium sauce pot filled with couple inches of water and topped with small stainless steel mixing bowl😄) Stir till chocolate is melted. It should take a few minutes. Turn off heat but keep chocolate over warm water, that way chocolate will stay consistant while rolling the balls. Now remove balls from freezer grab some toothpicks and start dipping. 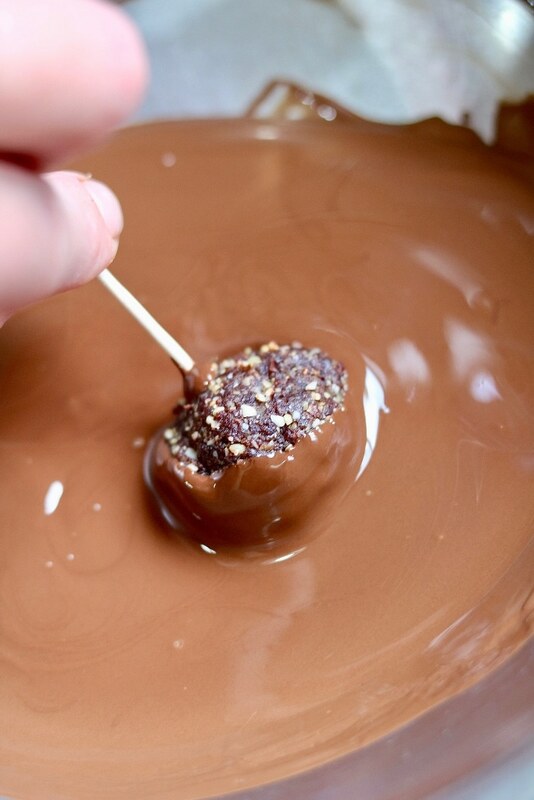 DO YOU NEED TO ADD OIL TO CHOCOLATE FOR MELTING? Feel free to comment below. I would love your feedback! 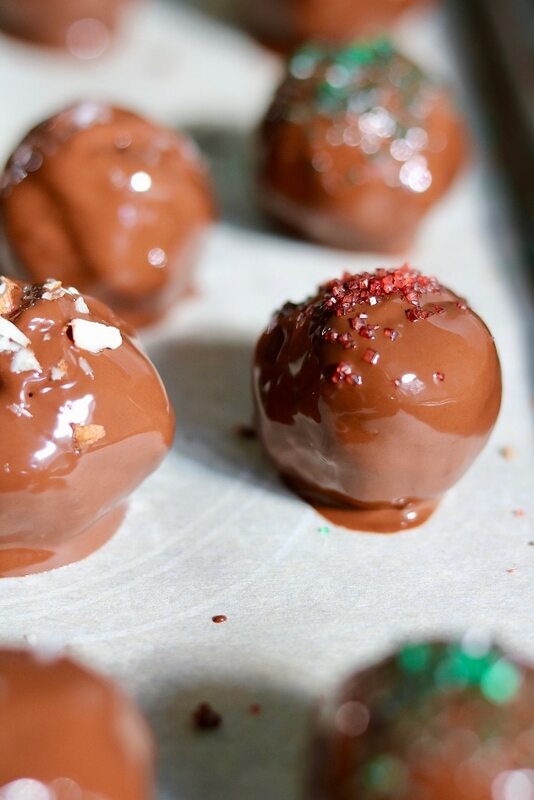 This easy, healthy and decadent Vegan Chocolate Truffles Recipe is perfect for the holidays. 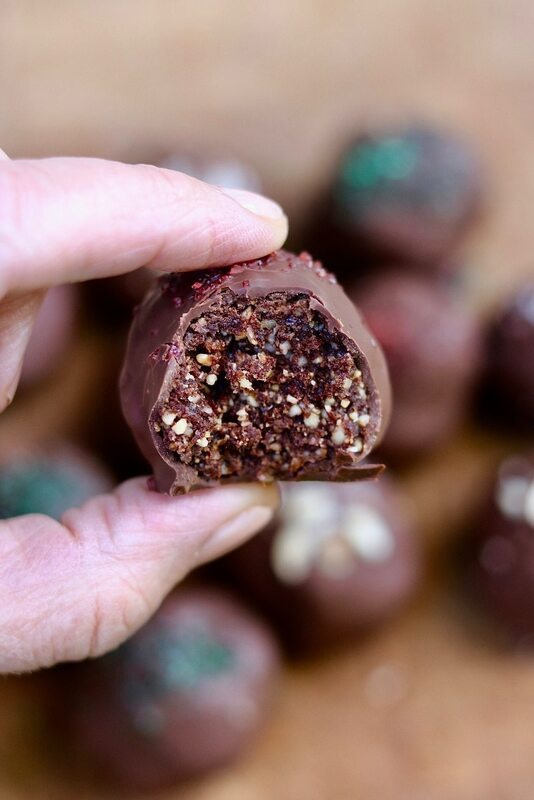 These Raw Vegan truffles are made with dates, almonds, sunflower seeds, walnuts, cocoa powder, peanut butter and vanilla, then rolled in melted dark chocolate- OH MY! And they’re gluten free and easily oil free. Add dates to a soup bowl and cover with boiling water. Meanwhile add all nuts to food processor and process till completely broken down. Drain the dates well and add them to food processor with rest of ingredients (except oil). Process till everything is completely mixed. you might have to scrape sides of processor a few times. You should end up with a mealy nutty mixture. Now just form one inch or so balls with your hand. It’s not so much rolling into a ball but forming one by squeezing the mixture with the palm of your hand and then shaping into a ball. These Vegan Truffles hold together really well. Now place formed balls on parchment lined tray and place in freezer to harden, while preparing your chocolate for dipping. Now start breaking up your chocolate bars and adding to your double boiler, along with oil ( if using) and set to medium-low heat, so water simmers gently ( my double boiler consists of a medium sauce pot filled with a couple inches of water and topped with small stainless steel mixing bowl) Make sure water doesn’t touch bottom of bowl. Stir chocolate till melted. It should take a few minutes. Remove balls from freezer. Insert toothpicks into balls and dip and swirl, one at a time in melted chocolate, set on parchment lined tray. If you are adding additional toppings, sprinkles,… etc do it after you add each ball to the tray. I have melted chocolate with and without oil. I feel it will work either way. Some say it thins the chocolate and makes for easier dipping. The choice is yours. These chocolates will keep fine at room temp in container on counter, but don’t package them till they are fully hardened. Feel free to store in fridge if your prefer them cold. If you love this recipe check out my Healthy delicious Chocolate Brownies YUM!! These look like the perfect holiday treat. Looking forward to trying this recipe out! Thanks so much Lisa😊 they are very tasty, and easy! I just made these , oh boy what a treat . Cannot what to share over the holidays . oh that’s awesome! Glad you love em. Thanks so much for your comment Midge 😊 happy holidays to you and your family. thank you, glad you enjoyed the recipe!